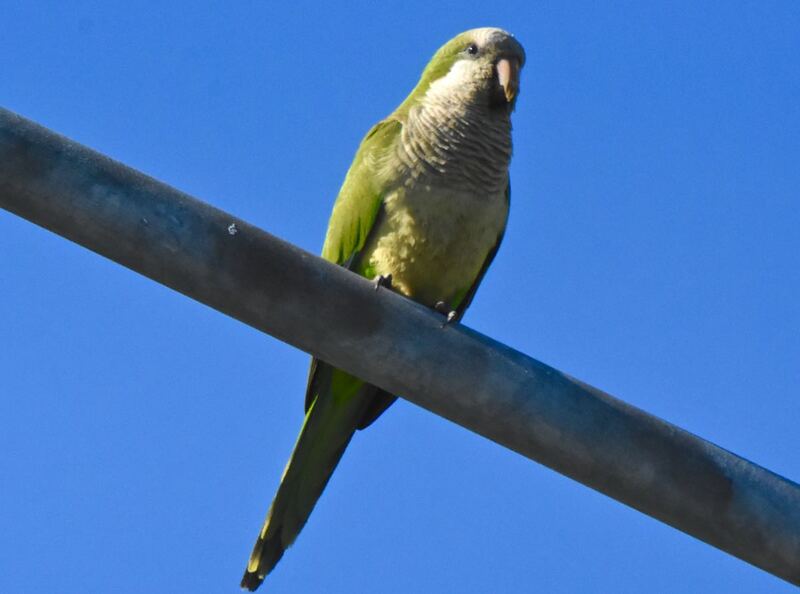 Monk parakeet, photographed near the Leon Weekes Preserve, Delray Beach, Palm Beach County, in June 2016. It's really hard to imagine anything more ill-melodious than a monk parakeet, Myiopsita monachus. Its squawking make crows and grackles sound like song birds by comparison. It's that annoying. Monk parakeets, as you might expect, are not native birds but rather imports from South America. They came to the United States in the 1960s through the pet trade — at the peak of the trade, as many as 16,000 of these birds were imported annually, according to the University of Florida. Through damaged shipping crates, escapes from private owners and zoos and intentional releases, the monk became established in cities as far north as New York, Connecticut and Rhode Island and as far west California, Arizona and Colorado. UF says the birds have appeared in 14 states, although many populations come and go. The Florida Fish and Wildlife Conservation Commission says monks are established in 52 of Florida's 67 counties. In their native range of Brazil, Argentina, Paraguay and Uraguay, monk parakeets are inhabitats of tropical and subtropical woodlands and savannas. Here, they stick to cities and 'burbs. They don't migrate, even in the cold north, but survive winters probably because they build huge, communal stick nests that they use year-round. A monk parakeet nest can weigh as much as a ton and house as many as 200 birds. Monks are about a foot in long with a wingspan of about 21 inches. They're mostly green, with gray on the top of the head, through the face, neck and chest. It has a pointed tail and a can opener-like bill. The monk's gray features distinguishes them from similar-looking birds. Monk parakeets eat mostly seeds, fruits, berries, flowers and leaf buds but they will also eat insects. Much of their food comes bird feeders, especially during winter, but a newly seeded lawn or farmer's field can be a source of a meal for them. That brings us to monk parakeet problem No. 1: They have the potential to be major agricultural pests. They are a big problem for farmers in their native range, where they raid grain crops. Some have feared the same thing would happen here, but it hasn't, probably because the birds stick to urban areas. But all bets are off if they ever get a taste for country living. Footnote: there was once a parakeet called the Carolina native to the eastern United States that was slaughtered to extinction largely because farmers saw them as pests. 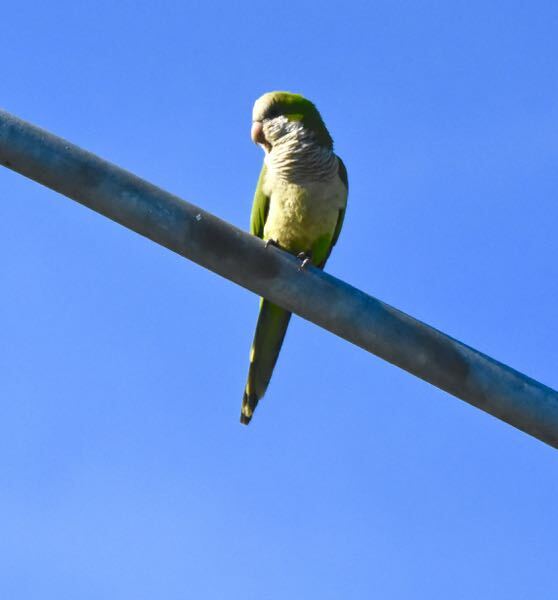 Monk parakeet problem No. 2. They like to build those massive nests of theirs on manmade objects, like light poles and fire escapes, but also on electrical utility structures such as line towers and substations. When it rains, the nests can cause shorts — and headaches for utilities. Otherwise, they're not invasive in the usual sense word; their presence doesn't harm native plants and animals. Clutches are five to eight eggs, which hatch in a little more than three weeks, with females doing the sitting and males feeding their mates. Offspring are nest-bound for six weeks. 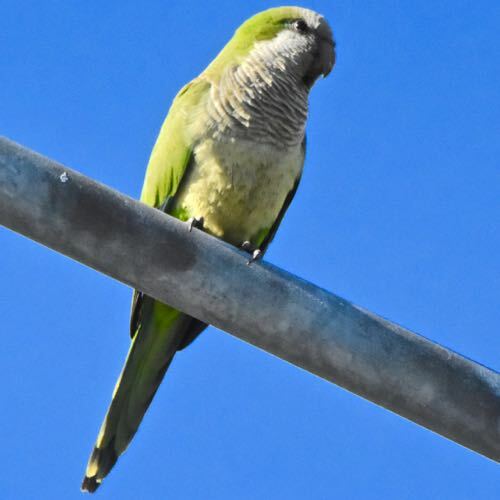 Monk are also known as Quaker parakeets. They are members of Psittacidae, the parrot family.